Earlier today, sports talk host on 92.3FM The Fan in Cleveland Joe Lull sent out a text that would turn Twitter into a stalking ex-girlfriend. Cavaliers owner Dan Gilbert is currently en route to south Florida. With that, Twitter was off and running. 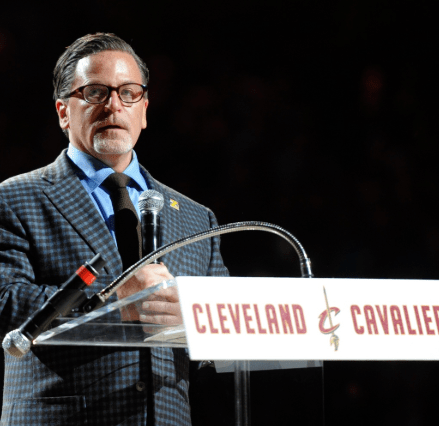 However, Cavaliers owner Dan Gilbert uncharacteristically responded to Lull. Even more uncharacteristic was that it was within an hour of the initial Tweet. Not only was the Tweet odd in content, the fact that Gilbert addressed the accusation rather than just ignore it sparked a lot of theories, obviously all about LeBron James going back to Cleveland. But we all know if you give the internet enough time, they will find out everything about you. For instance, somehow they found the wing number on Dan Gilbert’s plane and then found the flight plan online. So concrete proof, right? Possibly. What we know right now is that Dan Gilbert’s plane is on its way to Ft. Lauderdale, FL. What we don’t know is the reason and if Gilbert himself is there as well. So now we sit and wait to see if the internet finds Gilbert in Florida and can link him to LeBron James. It should also be noted that Brandon Leister pointed out the flight history associated with Gilbert’s plane matches that of meetings with Hayward in Indianapolis and Kyrie Irving in New Jersey. UPDATE: Anthony Lima from The Fan in Cleveland is reporting that LeBron James’ good friend Zydrunas Ilgauskas was on the private flight.